The Isle of Arran (19km by 42km) lies in the Firth of Clyde 28km west of the Ayrshire coast, 5km east of Kintyre peninsula. 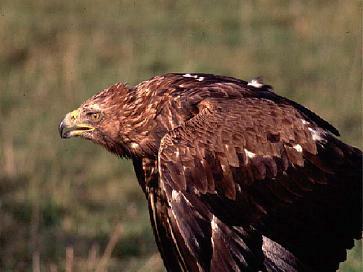 Its northern half is rugged, mountainous, remote country, good habitat for Golden Eagle and Red Deer. Goatfell (874m) peaks over the principal town of Brodick on the east coast. The south has gentler moorland, extensive conifer plantations with Red Squirrel and much of the island’s farmland. The climate is milder, the species range wider. Much of the coast is raised beach with a shoreline of rock or shingle, haunt of Otter , and steep escarpments. The wide diversity of habitat across the island results in a rich bird records list of over 200 species. The absence of Fox as a predator may contribute to Arran’s healthy population of raptors, notably Buzzard, Kestrel, Sparrowhawk, Hen Harrier and Short-eared Owl. may be in cleared forest. Red-throated Diver breed on remote hill lochans. Significant absentees include Great Spotted Woodpecker , despite suitable habitat and being on nearby Kintyre. Most of Arran is a Site of Special Scientific Interest. 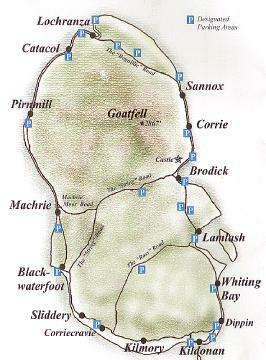 A good sample of northern habitat can be had on a 56km loop from Brodick: take B880 hill road, The String , to the west; fork right onto unclassified moor road to Machrie Bay; then by A841 main road north along the shore to Lochranza, east over The Boguillie pass and back along the shore to Brodick. Mountain, moor, shore and sea can be scanned all along the route. Walking tracks lead into the interior from several locations. Best part of Arran for birds of remote hill country, especially in spring/autumn: Golden Eagle, Raven, Red Grouse, Curlew, Wheatear, Meadow Pipit . Good for raptors in general: Buzzard, Peregrine, Merlin, Sparrowhawk ; with Hen Harrier and Short-eared Owl in suitable terrain. A good sample of southern hill country can be had on a 50km loop from Brodick: take B880 hill road, The String, west to Blackwaterfoot on the coast; then south 10km along A841 to an unclassified road, The Ross, up Water of Sliddery valley, over the moors to Lamlash and back along A841 to Brodick. Walking tracks lead into the interior from several locations. Many of the usual moorland species can be seen. 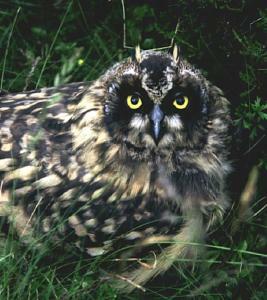 All year specialities include Hen Harrier, Short-eard Owl, Golden Eagle . Seasonally, the following are likely: Merlin, Whinchat, Tree Pipit, Grasshopper Warbler, Cuckoo, Twite . Beach/raised beach near Kildonan village (NS 017 207) signposted off A841 coast road some 20km south of Brodick. To reach Kildonan beach: from car park (NS 034 207) to right of old coastguard tower, pass play area to reach beach near hotel; or start at car park near old school house 1km to the west. Auchenhew Bay is reached from car park opposite village hall go left past shop/post office to path to west onto raised beach leading to Bennan Head (3km). The Arran Natural History Society, c/o the Ranger Service, Brodick Castle Country Park, has produced several useful guides to the wildlife of Arran: The Arran Bird Report , Arran Flora and Where Can I See …? – a guide to finding Arran’s wildlife and plants – all available from the Tourist Information Office (The Pier, Brodick, KA27 8AU, 01770 03 776), or local shops. There are two roll on-roll off ferries serving Arran, operated by Caledonian MacBrayne. The main one operates between Brodick on Arran (NS 022 60) (Phone: 01770 02 166) and Ardrossan in Ayrshire (NS 223 423) (Phone: 01294 463 470) taking 55 minutes to cross, sailing several times daily, with more in the summer. A smaller, 0 minute service operates between Lochranza on Arran (NR 925 510) and Claonaig on Kintyre (NR 875 560), April – Oct only. There is a secure car park at Ardrossan terminal. Brodick ferry has lift from car deck for wheelchair users. Can stay in car on Lochranza ferry. Arran’s roads are good for bikes (although they can be busy in season). National Route 73 links National Route 7 to Ardrossan, Arran and Kintyre. For details of the birds and other wildlife on Arran please go to the individual pages.